Yes, everything is better with bacon…even chicken! Ok in small portions. This was such a great salad and one that will be popular on our boat this summer, or actually, anytime we dare to go out in the cold and use the grill. 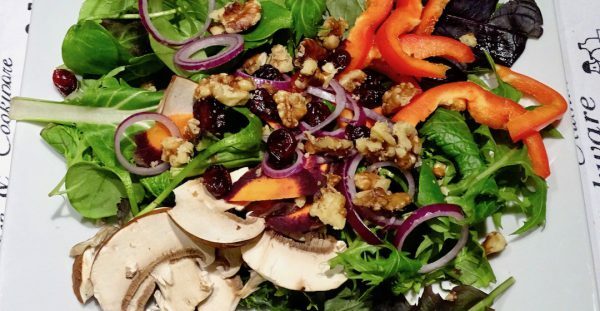 You can select any veggies you like on your basic salad but for me, I like a crunch! Lettuce is crunchy and crisp therefore all my ingredients have to be crisp and crunchy. 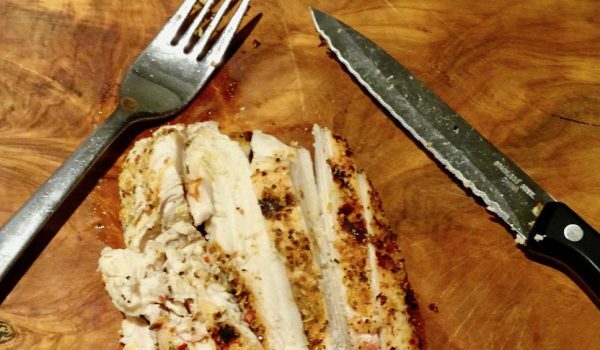 I’m fortunate I have access to Bio chicken weekly and love to grill them with my Cick’n Chick’n Seasoning. This seasoning makes the flavors so robust but you can use any seasoning you like. With the Cick’n Chick’n Seasoning, the salty smokey bacon flavor mixed with the white balsamic vinegar and the crunch of nuts and veggies topped with the tang of cranberries…just a great combo! Check this out and especially the dressing. I used my Field Salad Dressing but added a twist. You will need to whip up some Fool Proof Mayo or purchase an organic brand (watch the soy). Turn on the grill and coat your chicken with your favorite seasoning. Let it come to room temperature while you prep the veggies for the salad. Once veggies are prepped for the salad and divided among 4 large plates. Even the nuts and cranberries. I've also used fresh pomegranates and this added a burst of sweet-tart juice with each bite. Grill the chicken on medium for 7/7 (7 minutes on each side) works every time on our grill. When chicken is done, cover with foil and let it rest while you make the dressing. 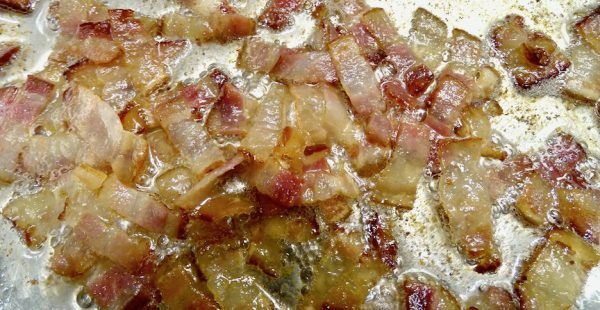 Fry the bacon in a small saucepan. You might have to add 1 Tbsp of ghee if it is Bio since it won't have much fat. Once the bacon is cooked remove it from the heat and let it cool down a bit. Once the bacon is cooled down, add the olive oil to the pan and give it a stir. Add the white balsamic vinegar next. Add 1/2 cup of Fool Proof Mayo to the pan and stir. 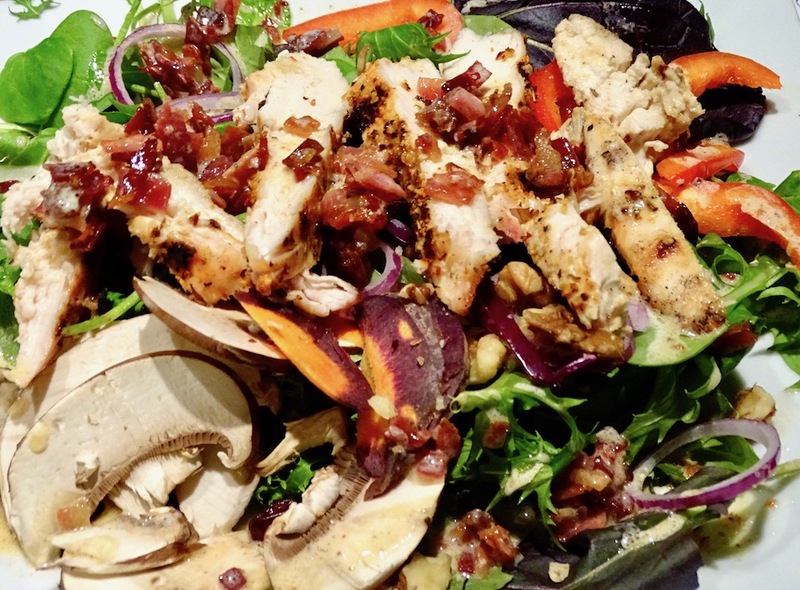 Slice the rested chicken in strips and place equal portions on the top of each salad. 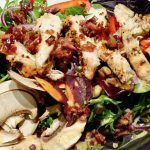 Top each salad with this yummy delicious warm bacon dressing!